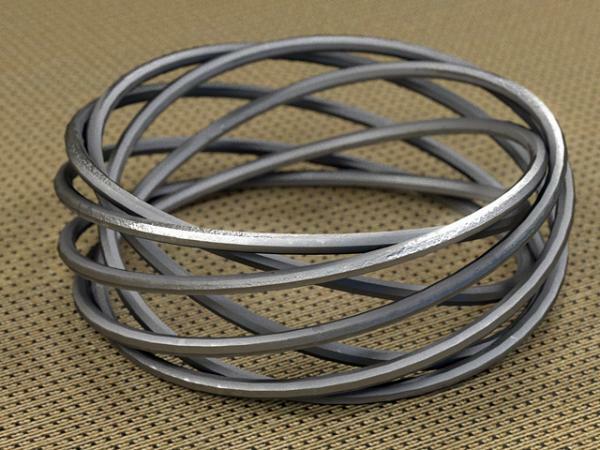 High quality spiral bracelet, modeled with 100% quad topology, and relatively light polygon count. There are a total of 2880 polygons, and 2880 vertices. This object has been UV unwrapped, and comes complete with detailed diffuse (color), specular (reflection), glossy (blurry reflections), and bump maps (2048x2048px). All preview renders were created using the same texture maps provided in this download. I've also included the UV template for the object, in case you wanted to create your own texture maps, but I suggest using seamless procedural materials for best results. The object measures about 2.7 inches in diameter (modeled to scale in decimal inches). This object is available in several scale-specific OBJ files. Please read the instructions below for direction on how to load the specific OBJ files into your application of choice. You are free to use or modify this model as you see fit for your own projects or scenes. As with all my freebies, this model can be used for both commercial and non-commercial renders. You may NOT, however, resell or redistribute these models or textures, or any derivative of them; individually, or as part of a package/set. PralineB (5 years ago) Inappropriate? beautiful and easy to wear ! Thank you ! I'll wear this to my next soiree! Thank you, Luxxeon! Very refined and beautiful! Thank you! Faeryl Womyn (5 years ago) Inappropriate? A woman can never have too much jewellery...lol Thank you.